I have no idea why on the one hand I seriously DO NOT care for cilantro but on the other hand I’m crazy for Cilantro-Lime Rice as served by both Chipotle and Qdoba casual Mexican restaurants. How do they do that? How do they take rice, lime and cilantro for goodness’ sake, and turn it into such a delicious side dish? I’ve been asking that question for a long time. Finally, I believe I have figured out how to make delicious, amazing Cilantro-Lime Rice that tastes for all the world just like the restaurants’—and for just pennies. 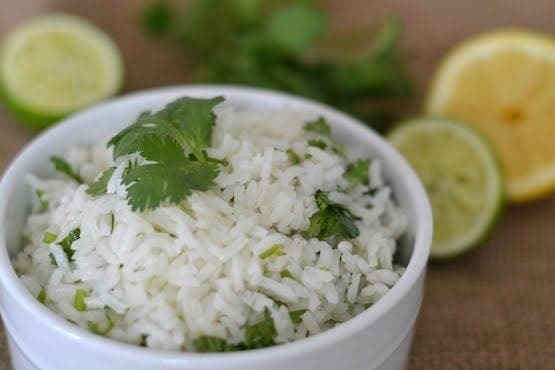 But before I get into the specifics for how to make Cilantro-Lime Rice, I want to tell you about something I have learned in this process—a super fast way to prepare plain rice from scratch in about 12 minutes give or take. My rice cooker takes nearly 2 hours to do the same thing. More traditional methods include preparing rice on the stovetop or in the oven with proper liquid to rice measurements followed by covered cooking at low temperatures until all of the liquid is absorbed. 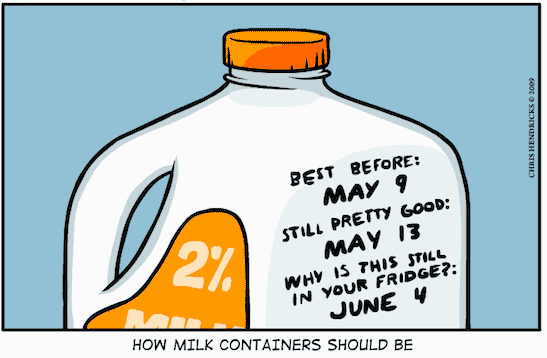 Confused by Product Dating? Yes, We Are! A. Throw it away because not many emergency rooms offer a stomach pumping family plan. B. Cook it to an internal temperature of 195 F. minimum to kill the salmonella; serve with a pungent sauce to mask any residual fowl odor. C. Relax. You and the supermarket have complied with FDA regulations requiring that this chicken be sold before the date on the label. D. Refuse to answer on the grounds that obviously this is some kind of a trick question. If you selected “D” you are right. This is a trick question and what better way to introduce an article on confusing dates than with a confusing pop quiz! The truth is that “C” would be correct if not for that word “regulations.” Except for infant formula and some baby foods, product dating is not required by federal regulations. It is a convenience offered to store owners by food manufacturers. Although dating of some products is required in 20 states, dating is voluntary on the part of manufacturers and processors. To further shake your confidence, stores are not legally required to remove outdated products from their shelves. So, it’s up to you to make sure you are getting the freshest products. 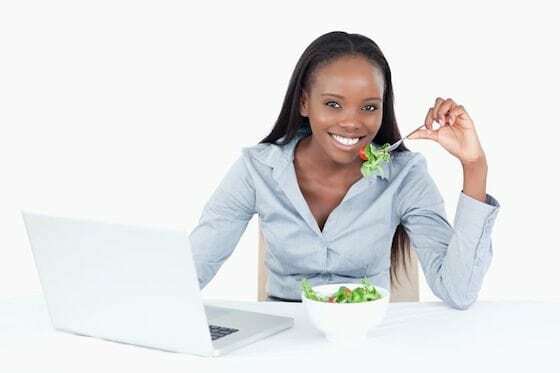 https://www.everydaycheapskate.com/wp-content/uploads/042816image3.png 358 547 Mary Hunt https://www.everydaycheapskate.com/wp-content/uploads/EverydayCheapskateNewLogo.jpg Mary Hunt2016-04-28 00:01:182016-04-28 01:53:13Confused by Product Dating? Yes, We Are! Which coffeemaker makes coffee the hottest and then keeps it hot without burning it? “Hot” is a nebulous term when it comes to coffee. For McDonalds, hot meant a big lawsuit when its hot coffee burned a customer who spilled it in her lap. For my grandson Eli, hot means anything even slightly warmer than tepid. 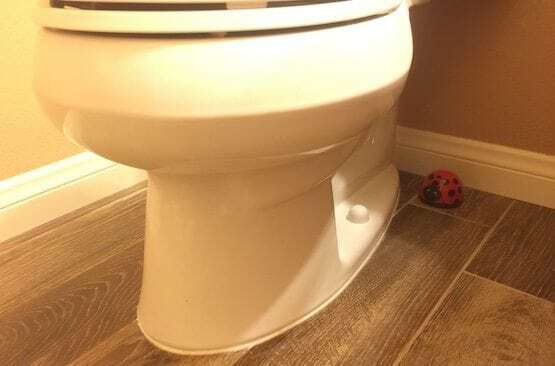 Can’t Remove the Carpet Stain? Cut it Out! DEAR CAROL: Bleach means done deal. There is no way you can “un-bleach” those spots. If you have a piece of spare carpet left over from when the carpet was installed, you can cut out the stained carpet and replace it with a patch from the new piece. If you don’t have that, cut the patch out of an inconspicuous area, like the back of a closet. Stick double-sided carpet tape onto the floor (or the pad if there is one) and press the patch into place. Because carpet has “nap,” done well the patch will be seamless and totally undetectable. If you are uncomfortable doing this yourself, call a local carpet repair expert. It should not be costly if you have the carpet piece ready to go. Good luck! 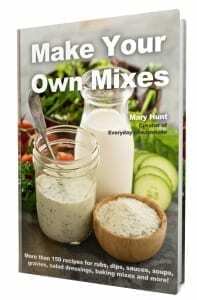 https://www.everydaycheapskate.com/wp-content/uploads/042516image.jpg 242 555 Mary Hunt https://www.everydaycheapskate.com/wp-content/uploads/EverydayCheapskateNewLogo.jpg Mary Hunt2016-04-25 00:01:572016-04-25 15:34:25Can't Remove the Carpet Stain? Cut it Out! Our Best Mother’s Day Gift Guide Yet! 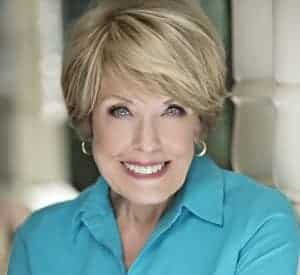 Since Mother’s Day is two weeks away and since I have a feeling you’re as surprised by that as I am and since I’m a mom and most of you are moms or know a mom or have a mother figure in your life–I’ve taken the liberty of assuming that you might appreciate some help coming up with an awesome Mother’s Day gift! 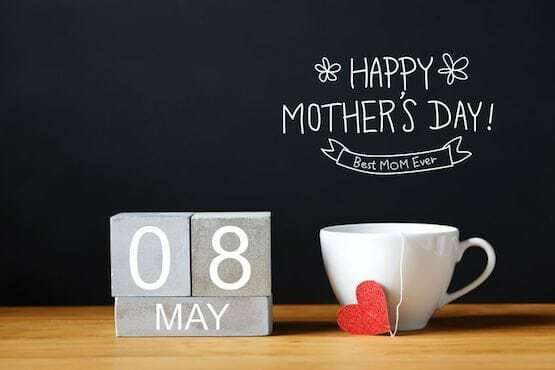 I wouldn’t say I am the ultimate expert when it comes to selecting perfect Mother’s Day gifts, but I know what I like and think I may not be too far off from what most moms would also enjoy. Here’s the deal: You love your mom. She’ll love these gifts. Easy as that. https://www.everydaycheapskate.com/wp-content/uploads/042216image2.jpg 370 555 Mary Hunt https://www.everydaycheapskate.com/wp-content/uploads/EverydayCheapskateNewLogo.jpg Mary Hunt2016-04-22 00:01:122018-11-14 16:15:23Our Best Mother's Day Gift Guide Yet! My readers do come up with great tips, tricks and ideas for how to save time and money every day. Today is no exception. From bugs to puppy poop—all the way to phone chargers and tomato paste, we’re about to cover a lot of frugal ground. DEAR MARY: I was wondering if you had a quick and easy way to keep the dish scrubbers (like the ones that have a sponge on one side attached to a pad for scrubbing pans on the other side) from smelling like mildew.